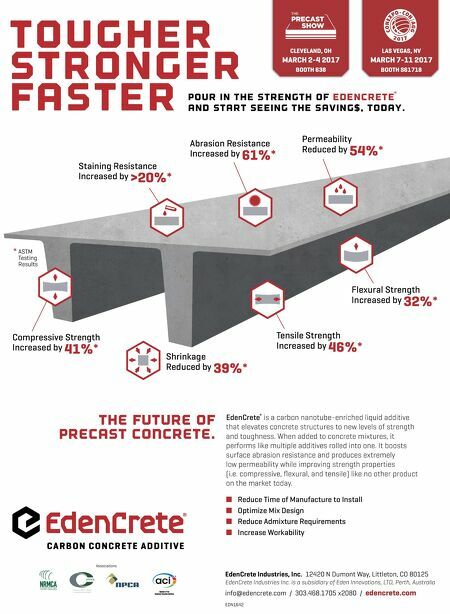 52 • February 2017 www.concreteproducts.com FEATURE PRECAST B F K C O N C R E T E R E C L A I M E R S Toll-Free (US): 888-235-8235 | Tel: (920) 894-1113 | Email: sales@bŅtech.com They Simply Work!™ Check out "The BFK Difference" at BFKTECH.COM So simple you can install, operate and maintain it yourself without the need of a factory technician! 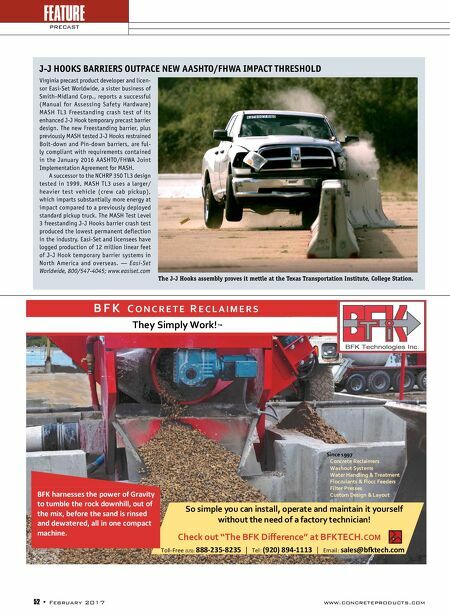 BFK harnesses the power of Gravity to tumble the rock downhill, out of the mix, before the sand is rinsed and dewatered, all in one compact machine. Since 1997 Concrete Reclaimers Washout Systems Water Handling & Treatment Flocculants & Flocc Feeders Filter Presses Custom Design & Layout Virginia precast product developer and licen- sor Easi-Set Worldwide, a sister business of Smith-Midland Corp., reports a successful (Manual for Assessing Safety Hardware) MASH TL3 Freestanding crash test of its enhanced J-J Hook temporary precast barrier design. The new Freestanding barrier, plus previously MASH tested J-J Hooks restrained Bolt-down and Pin-down barriers, are ful- ly compliant with requirements contained in the January 2016 AASHTO/FHWA Joint Implementation Agreement for MASH. A successor to the NCHRP 350 TL3 design tested in 1999, MASH TL3 uses a larger/ heavier test vehicle (crew cab pickup), which imparts substantially more energy at impact compared to a previously deployed standard pickup truck. The MASH Test Level 3 freestanding J-J Hooks barrier crash test produced the lowest permanent deflection in the industry. Easi-Set and licensees have logged production of 12 million linear feet of J-J Hook temporary barrier systems in North America and overseas. — Easi-Set Worldwide, 800/547-4045; www.easiset.com J-J HOOKS BARRIERS OUTPACE NEW AASHTO/FHWA IMPACT THRESHOLD The J-J Hooks assembly proves it mettle at the Texas Transportation Institute, College Station.